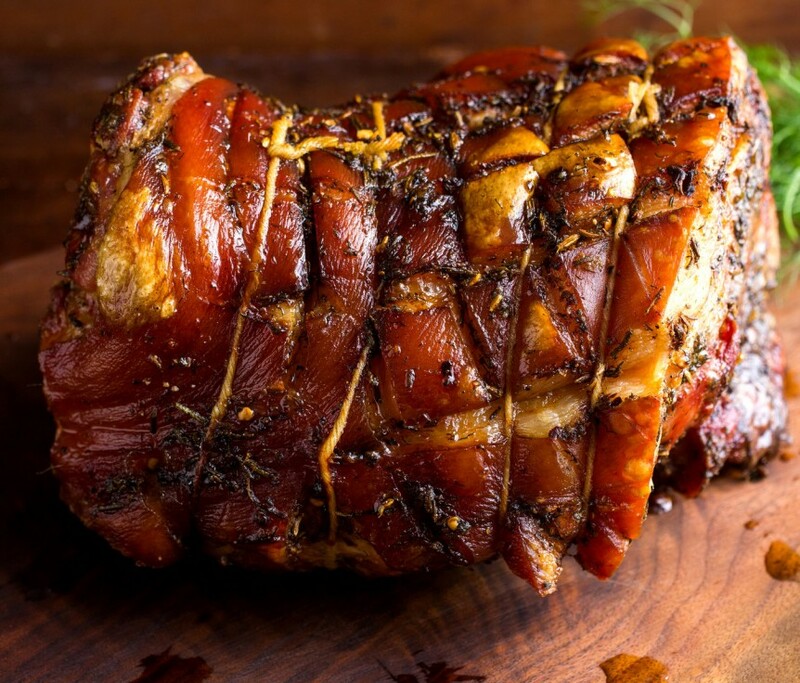 The classic Italian spit-roasted piglet gets a simple, oven-friendly take in this delicious recipe, which uses a boneless pork jacket for similar results. It can be also made in advance, so it’s an ideal dish for serving at large get-togethers. Start by preparing the stuffing. Peel and dice the onions, then peel and finely slice the garlic. Roughly chop the chicken livers, then pick and finely chop the rosemary and thyme. Soak the breadcrumbs in water. Sweat the onion and garlic in a good lug of oil in a frying pan for 5 minutes over a medium heat. Add the minced pork and chicken liver, and cook until the pork turns light golden brown. Throw in the chopped herbs and sage and cook for a further 5 minutes. Deglaze the pan with the vin santo, take off the heat and add the pine nuts and sultanas. Gently squeeze out the bread, allowing a little water to remain, add to the pan and bring it all together. Season and set aside to cool. Butterfly the pork belly like a book, rub with the 50ml of vin santo and some sea salt and black pepper, then pack two-thirds of the stuffing tightly over the entire surface. Close the belly, then add a final layer of the remaining stuffing and wrap it like a swiss roll, starting at the belly end. Next, tie up the meat using 10 lengths of butcher’s string, each about 30cm. Tie very tightly around the middle of the joint, then at either end, about 1cm from the edge. Keep going along the joint until you have used up all the string. The filling should be well wrapped – if any escapes from the sides, push it back in. Using your hands, massage 1 tablespoon of oil all over the joint, then rub with salt and pepper. Slice the carrots lengthways, then arrange like a trivet in a large roasting tin and place the joint on top. Pour over the white wine and roast for 30 minutes, then turn down the heat to 150ºC/gas 2 and roast for 3 hours. Remove the joint from the oven, drizzling some of the juices from the roasting tin all over it. Insert a fork at either side of the joint and lift onto a wooden board. Leave to rest while you make your gravy. Skim away the excess fat from the roasting pan and place it over a low-medium heat. Whisk in the flour and let it thicken for 2 to 3 minutes, stirring constantly, then add the wine to loosen. After another 3 to 4 minutes, stir in the chicken stock and continue to cook for 10 minutes. Strain the gravy and serve with the pork, which can be eaten hot or cold.